YouTuber Samcrac is well-known for having rebuilt a totaled example of Domino’s amazing oven-containing DXP delivery car. 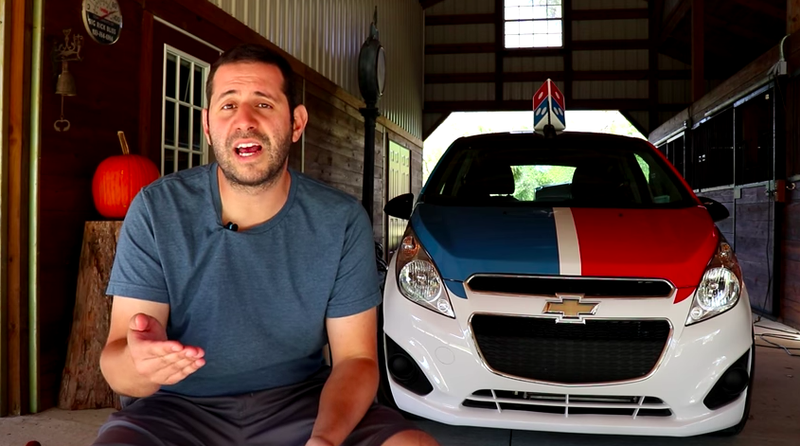 But now, he claims, people affiliated with multiple pizza franchises are trying to force him to give the Chevy Spark-based pizza-carrier back, or to have its Domino’s-themed exterior markings and hardware removed. Samcrac, whose real name is Sam (he didn’t want me to use his last name), wouldn’t specify on the record which specific pizza franchises or brands these people were affiliated with, though it shouldn’t be hard to figure it out. After reviewing YouTube’s Trademark guidelines, he figured this complaint wasn’t an issue, especially since the video-hosting service didn’t remove his video. After a few months, Sam—who subsequently bought a second Domino’s DXP car—received a call from “a person affiliated with multiple pizza franchises” (Sam was careful in how he worded this), who asked Sam to remove the exterior graphics, as well as any propriety hardware, including that pizza-warmer on the side. “Make it back into a Chevrolet,” Sam told me the man said, asking him to put a regular door in place of the oven. Sam got a second call a few days later from the same gentleman and another guy from the same organization (i.e. they both represent multiple pizza franchises). “Basically, they started up that phone call immediately, they said ‘we’ve got a purchase agreement written up right here,’” Sam told me. Sam says the men continued, saying “The purchase agreement is for x amount, and there’s 80 pizzas for your charity. Following that... we’re purchasing the car.” Sam mentioned that this proposal stipulated that Sam would be accompanied by someone from their organization when he took the 80 pizzas to charity for his YouTube channel. When Sam declined, saying he’s received a higher offer from a private buyer, the men threatened to send him a “cease and desist,” though the email he got later was a purchase order for the car and an attorney’s letter accusing him of trademark infringement. That letter ends with the quote: “Thank you for your prompt attention to this matter. I look forward to receiving your prompt signed counterpart soon,” referring to the purchase agreement. Sam, who seemed nervous on the phone, told me that this is his “first foray into the legal world, period,” and that he’s had to hire an attorney. Domino’s has a point and Sam is missing it. “Fair use” is a doctrine that protects someone from a copyright violation claim - not a trademark violation claim. Domino’s is saying that he is violating their trademark by showing the car in its Domino’s livery, with the prominent name and logo of the company on the car - which, coincidentally, looks just like official cars used by Domino’s. Of course, if reps from Domino’s have told him that the only solution here is to sell them the car, then that’s a bit heavy-handed. The obvious solution here - if trademark violations are being dealt with - is to simply remove the marks from the car. Domino’s can’t claim they own the car - or have rights to it - simply because their name is on it. We’re trying to get in touch with the franchise that used to own the car, and we’ll update this story when we do. The DXP Is Pretty Cool. I'd Buy One.